In the midst of being horrified by most of the news, I'm also trying to get ready for Christmas, which means I'm doing a lot of gift shopping. I suspect at least some of you are in gift shopping mode, too, so I thought I'd share some gift ideas. None of these work for the people left on my list, but maybe they'll help someone else! For the tea lover, check out Lupicia Tea. They have "plain" tea and tea that is mixed with other ingredients for flavor. I usually prefer a good plain black tea to flavored, but their flavors are pretty awesome. My sister in law gave me a couple of tins from their Australian collection, and when we visited a Lupicia shop during our trip to Torrance I bought several tins from their Hawaiian collection. I also signed up for their newsletter, which comes with a single tea bag sample every month. Every single tea of theirs I've had, I've liked. It is definitely a step up from my usual stuff, and my usual stuff is pretty darn good. Plus, their tins are really pretty. For the chocoholic, try giving a tasting set of single source chocolates. I first discovered the joys of single source chocolate during a visit to San Francisco, when I stopped by Dandelion Chocolate. It is really fun to try to the different bars and taste the subtle differences. You can order from them (and their chocolate is soooo good), but if you're looking for something more modest, Trader Joe's has a "tasting passport" box that is pretty good, too. Nice lotions and bath gels are a good "upgrade" gift, too, but in this case you need to know two things: (1) what sort of product the person usually uses, and (2) what smells he or she likes. If someone usually uses a supermarket shower gel, Bath and Body Works or The Body Shop will be an upgrade. If they're usually using Crabtree and Evelyn, you'll have to go even more upmarket. L'Occitane would be an option in that case. Lush is another good option for this sort of gift. Their Dream Cream is a personal favorite of mine. I'm obviously no help on scents, but a light citrus-y sort of thing is usually safe. If you give a bath gel, include the matching lotion. That makes the gift more luxurious feeling. I've also gotten some good blank notebooks, which I suspect were chosen because people know I like to write. This can be tricky, though. Some people have really strong preferences on notebooks. Moleskines are generally considered good (bonus points if they have a special collection item that fits the recipient's interests). I use a Moleskine for the idea notebook that I started keeping after reading the books about being a scanner/renaissance soul. 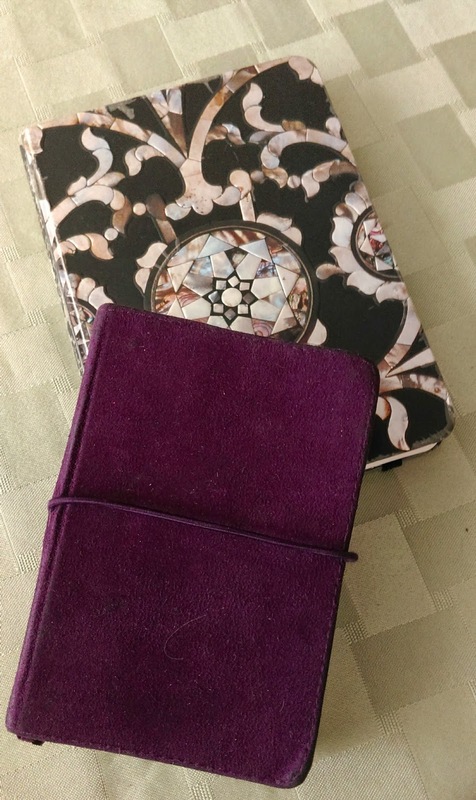 It is not my preferred size for carrying in my purse, though, so I also carry a smaller notebook for ideas about things to write and snippets and phrases I might use. These tend to come to me at random times and fly away if I don't write them down soon, so I like to carry a notebook in my purse. I have a 5.5 x 4 x 1 inch notebook that I bought on a trip to New Zealand that I'm using right now. I actually find that to be a bit too small for good writing flow, though, so as soon as I fill it up, I'll switch to a 5 x 7 x 0.5 inch notebook my in-laws gave me. I find that size works much better for writing. Like I said, it is personal. I don't mind getting random notebooks as gifts, though, because I always end up finding a use for them. Other people may be less forgiving, so use this idea with caution. Books- electronic or otherwise- are another set of "go to" gifts. If you have any scientists or engineers on your gift list this year, two good options are What If? : Serious Scientific Answers to Absurd Hypothetical Questions from xkcd's Randall Munroe and WTF, Evolution?! : A Theory of Unintelligible Design from Mara Grunbaum (who runs the awesome WTF, Evolution tumblr). One of my hubby's favorite gifts was a polo shirt from the xkcd shop - not sure if it's still available, but it's a sort of twist on the "give them an upgraded version of something they need". I will be getting him the Randall Munroe book this year, too. Often overlooked, but ornaments can make a wonderful gift. I know this takes us into the sometimes contested area of taste, but there are beautiful ones of birds for example - my boys love these. They have glitter on them and look beautiful on the tree. We didn't start with any ornaments, so I have a tradition of buying them a new one every year. My mother's tradition is to buy everyone socks (really nice smart wool socks). My brother's tradition is a little gourmet food basket - the high end ingredients that foodie types love but don't always want to buy themselves, like truffle oil and Himalayan salt. For my boys, I spent an absurd amount of money on an ebay discontinued harry potter lego set. In addition to heaps of lego, we're doing puzzles, books, and snap circuits. I also found these beautiful vegan, non toxic nail polish in the most wonderful colors (fabulous sparkles for the kiddos): sparitual. I like to give bags and scarves (usually I already have some idea of what they like by seeing what they use, and if they're open to more than that ONE favorite item). Also, nice wallets / pocketbooks. My aunt likes to give socks too, which we always love. Same aunt also comes up with creative things you didn't know you needed but which you have to always have once you know of them type things, eg. the little bags that fold into a tiny square that you can keep in your hand bag or jacket pocket for unplanned shopping. Another gift that's generally well received (and used) by friends who like entertaining is nice serving bowls (sometimes sets). Best "off the list" gift I've ever gotten: the quesadilla maker we got for our wedding. I use that thing all the time, but when I opened it I didn't think we'd use it much at all. I wish there were girls in the family that I could give Roominate to (mine are too young and my nieces too old) - mostly so I could try it out...I love the idea of wiring a dollhouse! Roominate is cool. It is for small dolls- like the size of those princess dolls with the molded plastic clip on dresses. My kids made a bunch of furniture for their cardboard princess castles out of it. Beautiful Christmas notebooks.I want to say that Searching for the ideal Christmas blessing for the kid in your life? These toys and recreations are fixing the lists of things to get of children all over the place. Whether you're shopping for a child, nephew, younger sibling, cousin, or grandson, there is something on this rundown that is age-fitting for that young man on your vacation shopping rundown. Perused on to see which toys are popular this Christmas season. Happy X-Mass!